Do you have a favorite BBQ food? You would be surprised how many people prefer chicken over hamburgers. Find out how to keep track of your friends' favorite foods with this Venn diagram for kids. 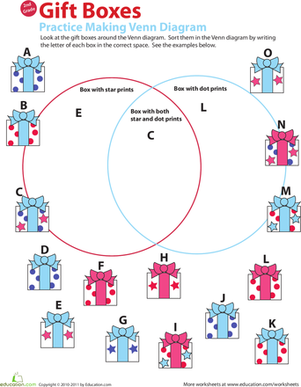 Kids practise making a Venn diagram about kinds of gift wrap by sorting the gifts in their correct spaces in this year 3 maths worksheet. Kids practise reading a Venn diagram about favorite hobbies and answer questions about it in this year 3 maths worksheet. 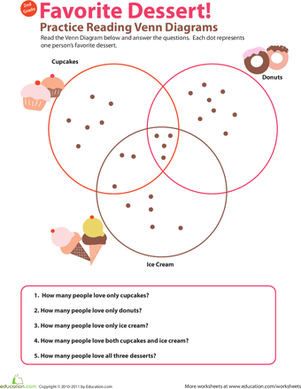 Kids practise reading a Venn diagram about favorite desserts and answer questions about it in this year 3 maths worksheet. 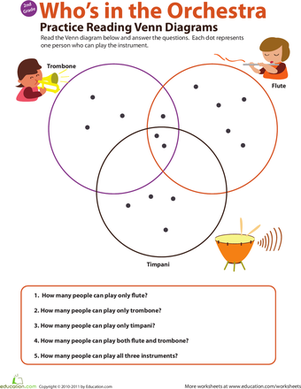 Kids practise reading a Venn diagram about instruments in an orchestra and answering questions about it in this year 3 maths worksheet. Students will practise coming up with questions by analyzing the data given in this Venn diagram.